Are you looking for the ultimate in beach wedding music for your special day in Fort Lauderdale? How about fantastic steel drum music for your corporate event? 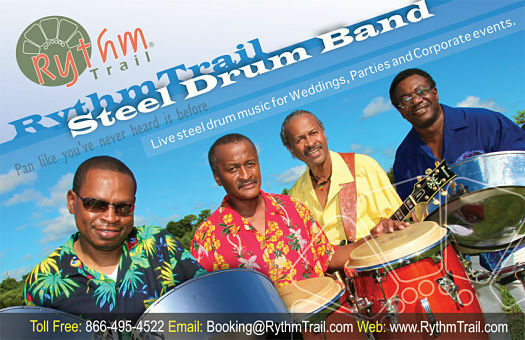 No matter what event, party, gathering or reception you need music for, RythmTrail steel drum band has got you covered. RythmTrail can play your favorite reggae, calypso, soca and steel drum music for any event, party or gathering. They’re just a click or phone call away from giving you a quote! With over 20 years of experience hosting events around the world, you can be sure you’re going to get the best steel drum band for your party. RythmTrail plays beach weddings, private parties and corporate events in Ft. Lauderdale, as well as all over the state of Florida, nationwide and internationally, so you can be sure you’ll get the sweet sounds of the Caribbean Islands wherever your event is located. Let RythmTrail play your own song playlist with one, two or more steel drum players or let them create their own combination of romantic, upbeat or dramatic music that suits all ages and audiences. So what are you waiting for? Call RythmTrail today at 866-495-4522 or get a quote online and make your next event a fantastic tropical experience that you and your guests will never forget! The steel drum band at our wedding was absolutely AMAZING!!! We had so much fun dancing with you guys and playing the drums. You made everything so perfect, we got so many guest compliments on the band choice. Thank you so much for everything. I just realized in all of the wedding mayhem we forgot to give you guys a tip!!! I’m so sorry about that, we really did appreciate everything. Can I go to your link and add a tip? Ephraim and the group did a wonderful job at our corporate event in Hollywood, FL. I don’t think there is a song that they cannot play on the steel drums! I would recommend them to anyone planning a tropical or beach related themed event! Thanks for the wonderful music and Ed’s party, the steel drum band made the party. Can’t wait for next year party. Thanks again for a great show, everyone loved you. The Steel Drum player did an excellent job at my wedding, I would definitely use your company again. You guys were so quick responding to emails and we had so many complements on how awesome the music was. A great party! We loved every minute and so much appreciation to you for setting the “beat”. Everyone is still talking about the music – how perfect it was for listening, dancing and humming along to some old familiar songs with a calypso beat. The band was spectacular, we have truly enjoyed the most unreliable talented musician, all my guests have asked for their business card, I haven’t heard a steel drum player that good in a long time and he satisfied all of the guests.Fabulous steel bands player ever, cannot wait to have another party to enjoy his music once again!!!!! The Steel Drum Band was fantastic! We had them play at our wedding reception cocktail hour and we felt like we were in the Caribbean. Highly recommend!! I highly recommend the Steel Drum Performance to everyone. The internet is easy to follow and quote I receive the same day. They response promptly to all my questions. The contract and payment are easy to follow and hassle free. The Steel Drum personal showed up early to my event so I know he was there and started on time. My event is 50th Birthday Party and Family Reunion at the same time this was a Sunday Brunch. The ambience that he provided was exactly what all of us expected. In a nut shell performance, professionalism, and ambience is why I highly recommend them. Just wanted to say thank you for playing at my party Sat nite – Your music was so perfect, the singing was great, and I couldn’t have picked a better Calypso band! Everyone thought you were fabulous! Next time, I will have to rent a dance floor too! Could we hear the steel drum band in Fort Lauderdale / Hollywood Florida area? Today Mar 5 2016 RythmTrail Steel Drum Band will be playing at Diplomat Resort Landing. The best steel drum band in Fort Lauderdale area. Hire for wedding, birthday parties, corporate functions and more. RythmTrail Steel Drum Band gig update Feb 20 2016. We are jammin live steel drum music tonight in Sunrise FL for a 50th birthday party. Hire the best steel drum players for weddings and events in Fort Lauderdale FL area. Thankful for a great start of the new year 2016. Our steel drum players will be jammin in Fort Lauderdale FL today at an annual new years day neighborhood lunch party / brunch. Hire the best steel drum band & players for beach weddings, rehearsal dinners, parties, corporate events, brunch, cocktail hour, baby shower & more in Ft Lauderdale Florida.